The second image has had a bit of post processing added; the white doesn't really have a border or a drop shadow. The code now lets users test out paths, so it's getting closer to the idea of a simple walk around adventure game. Of course path smoothing can be added by using a spline to connect the nodes, more nodes could be added to each edge (or even the Funnel algorithm which I eventually gave up on adding :D), there's plenty of obvious improvements! 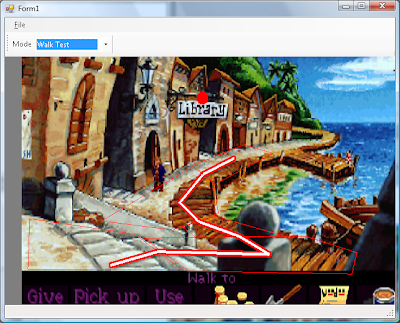 I'm not going to be doing character scaling, at least not any time soon, so this monkey island scene won't be my final test scene. 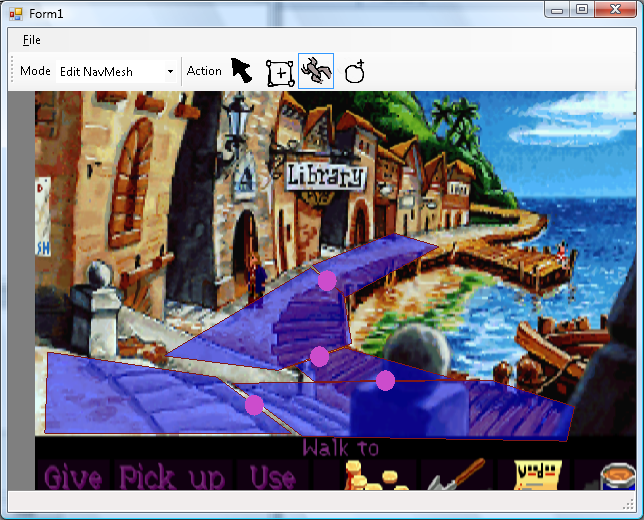 The next step is moving a character a long the path and playing the correct animations at the correct time. The hardest bit will be finding some suitable test animations.